2 Day Festival passes are valid for the entire weekend that you purchased. Single Day Festival passes are only valid for the specific day that you purchased. 2 Day Festival pass is a single wristband that is worn both days. Wristband activation will be required for entry into the festival. Ages 7 & older require a festival pass. No switching single day passes. Online Orders received after April 24th will need to pick up wristbands at Will Call. Will Call Locations will be available at the Chukchansi Park Box Office prior to May 4th. Will Call Location on May 4th and 5th will be inside Woodward Park just outside the festival entrance. Absolutely no outside food or drinks. We will have a wide variety of food options available including vegetarian and vegan-friendly options. Soccer Balls, Footballs, Frisbees or other projectiles. Any item that can be used as a means to disturb the peace, endanger the safety of the crowd and/or inflict damage to people and goods. Prescription medications are allowed only in the original prescription bottle, any persons attempting to bring in prescription medication must have a government-issued photo identification card that matches the name printed on the prescription, and the pills in the bottle must match the description printed on the prescription. Further, if a patron has mixed multiple pills in a single prescription container or if a person is attempting to enter with prescription pills in a non-prescription container, medical representatives should be involved to make the final determination about whether or not such pills are to be allowed in the venue. CamelBak-style water bladder systems are allowed empty into the Event Site, however the water bladders themselves must be capable of being removed from the carrier and must be transparent enough to allow security to visually inspect the empty bladder. CamelBak-style water bladder carriers must have no more than two (2) main compartments and one (1) small compartment – anything larger will not be allowed. Any CamelBak-style water bladder system that has a bladder that cannot be removed from the carrier and/or is opaque enough to prevent visual inspection will not be allowed into the Event Site. Grizzly Fest strictly prohibits the operation of or use of any unmanned aerial vehicles (UAVs), also known as “Drones,” on, from, or above Grizzly Fest premises, events or venues without specific written permission from an official of Grizzly Fest or IAN Group. This includes all UAVs regardless of size, weight, or purpose. If you are found to be using or in the possession of a UAV or “Drone” while at Grizzly Fest, it will be confiscated by staff and held for the remainder of the event. Our city’s park and our Festival grounds mean a lot to us. Whether you’re eating and drinking your way through the Park or busting the roger rabbit thinking no one is watching you, remember to follow these simple health and safety tips from our team. Remember to spread the love and positivity so we can continue the party for years to come. DO tune in to your surroundings and if you see something, say something. Look for a member of Grizzly Fest Medical & Safety team and clue them in. DO remember that late Fresno Springs can get very hot. Be prepared – Drink plenty of water and stay hydrated. Look for our hospitality groves to get some shade and cool off. DO keep an eye on your friends and get them help if you think they need it. Don’t be afraid to talk to our Medical & Safety staff, anything you tell them is confidential. Everybody entering the festival site will be subject to search. Our primary goal is to create a safe and secure environment for all festival attendees. To ensure this, there will be on-site security provided by local police and peer security companies. If you're experiencing any problems whatsoever, locate a festival staff member. American Ambulance will be on-site to help you with any type of medical problem. Head to the nearest medical tent or look for a festival staff member if you need assistance. Information Booths are located at the Box Office, and inside next to the ATM’s. Stop by to get your questions answered, pick up a Grizzly Fest Program Guide, check out the Festival Map, or just to say hi. Our local retail vendors offer a wide selection of craft and hand-made wares - if you’re looking for a screen-printed shirt, sunglasses, posters or even a charge for your cellphone, you’re in luck! Reasonably priced food (including vegetarian/vegan options) and drinks will be available on-site. More information about the food vendors and options will be released in upcoming weeks. American Ambulance will be on-site to help you with any type of medical problem. If you need assistance, go to the medical tent, or look for a police officer or festival staff member. Lost and Found will be held at both Info Booths. Stay tuned for updated 2018 info. TERRAIN: Grizzly Fest is an outdoor festival, taking place at Woodward Park. This is a large venue with great distances between stages. The grounds of the event is a little more than 20 acres. Most travel is done over natural terrain of mowed grass, occasional sand, some packed-earth pathways and a few paved paths. One difficult aspect of travel in this park is that there are some steep changes in elevation. Despite the difficult terrain, many people who use wheelchairs or other mobility devices come prepared and are able to attend and enjoy Grizzly Fest. At Grizzly Fest, Main Stage, raised viewing platforms are reserved for people who use wheelchairs, or who have a mobility disability that would make it very difficult to stand in the audience. One companion may accompany the person with the mobility disability. Families who have one or more member with a disability may stay together on the platform. “Family” is defined as two adults and any children 18 years or younger. Please note that these areas have limited capacity and are available on a first-come, first-served basis. The festival provides folding chairs and makes every attempt to provide enough for everyone on the platform. WHAT’S NOT ALLOWED: Grizzly Fest is a crowded event. For safety reasons, powered mobility devices that move faster than a walking speed, or are heavier and larger than a wheelchair or scooter, including two-wheeled scooters, golf carts, or all-terrain vehicles, are NOT allowed. OTHER DEVICES: Other types of mobility devices will be evaluated on a case-by-case basis. To ask permission to bring a powered mobility device other than a wheelchair or scooter, contact info@grizzlyfestival.com no later than one week before the event. Grizzly Fest personnel may ask individuals using another type of power-driven mobility device for a credible assurance, such as a valid Federal or State-issued proof of disability, that the device is required because of a disability. Accessible portable toilets are located in every cluster of portable toilets in the festival grounds. See Festival Map for exact locations. For all ticketing questions and concerns, please contact Festival Ticketing customer support service directly at: 855-771-3667 or through their website: http://support.festivalticketing.com This includes any questions regarding purchase, address changes, confirmation emails, shipping info, etc. Q: What can/can’t I bring inside the gates? A full list of what you can and cannot bring into the festival can be found at here. 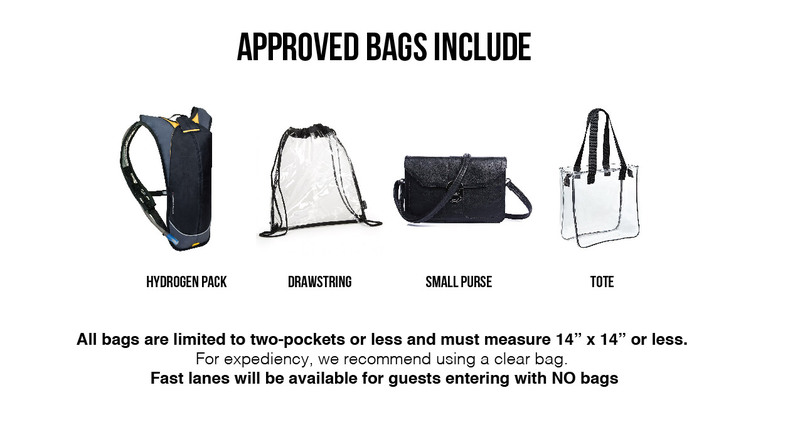 NOTE: Grizzly Fest is requesting that fans bring CLEAR bags, or no bags, when attending the festival. There will be an expedited entrance line for fans carrying no bag or clear bags. With the extensive security measures that are necessary to keep our festival safe, bringing a regular bag or backpack will result in a delayed entrance and longer lines. Q: Is the festival accessible to patrons with disabilities? Yes, we strive to make Woodward Park as accessible as possible, including accessible parking, raised viewing areas, and a golf cart shuttle system. No outside food or drinks will be allowed inside the Festival grounds. Grizzly Fest partners with some of the best restaurants and food trucks the San Joaquin Valley has to offer. Find a full list of vendors and menus on your mobile app or at grizzlyfestival.com/food. Gluten-free, vegetarian, and vegan options will be available. Q: Where can I get a program guide? Program guides will be handed out upon entry into the festival (until supplies last). They will also be available at the Info Booth. Q: What stage/time does “X” artist perform? Plan out your day at the Park. A full lineup is located on your mobile app, on the website, and in your program guide. A large daily schedule will be available to view at the Info Booth. Q: Where can I find a festival map? You can find a festival map on our website, and in the patron guide. A large festival map will be available to view at the Info Booth. Q: What time does bike valet close? Bike valet is free and open Friday & Saturday from 10am-11:00pm. Q: Can I stay overnight in the Park? Q: Can I leave the festival and return the same day? In general, re-entry is not allowed. You may enter the festival gates once each day. However, if there is an emergency and you must leave the festival and need to return the same day, you must speak with a Supervisor at any festival entrance/exit BEFORE LEAVING to be scanned out. Q: Is Grizzly Fest all ages? Grizzly Fest is an all ages event and does not require a minimum age to attend. In addition, we do not require parental supervision for underage patrons, however, we would like to clarify that the safety and overall well-being of our festival goers is our highest priority. Each year we strive to make Grizzly Fest a safe and unforgettable experience for each and every attendee. Q: Do children get in for free? Children under the age of 7 are free and do not need a wristband to get into the festival. Q: How do I get to the festival? Q: Can I bring in my prescription medicine? You may bring in medical prescriptions as long as your name is clearly on the prescription label and you have a valid ID. Names on the prescription must match your valid ID. Q: Can I sell 1 day of my 2-day pass? For your 2-day pass, you will only receive ONE ticket (in wristband form) that you will wear each day to grant you access into the festival. Thus, if you choose to sell your 2-day ticket, you must sell both days. This is due to the tickets being in wristband form. It cannot be removed once put on, and any loose wristbands will be confiscated. Any wristbands that have been tampered with will be void and you will not be given access to the festival. Q: How do obtain a media credential or photo credential? Email info@grizzlyfestival.com and include establishment you are wanting to cover the event for. Q: Interested in sponsorship opportunities? Q: I still have a question. Please send questions to addresses with associated topics. If you are unsure which e-mail to use, please email info@grizzlyfestival.com.